The Forest Stewardship Council® (FSC) is an independent, non-governmental, not-for-profit organization established to promote the responsible management of the world’s forests. 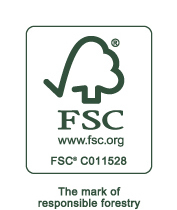 Acoustigreen is FSC Certified and can provide many of our wood products from certified wood. Click to download FSC CoC. Please contact us with any questions regarding our FSC Chain of Custody Certification. *To learn more about FSC Chain of Custody, please visit FSC.org.